For a friend’s Christmas present it was suggested to get fishing equipment, something for fishing bass. Japanese are mad about fishing, get some Japanese stuff I was told. Well that statement is about right. We asked at one fishing shop, Sansui Shibuya, and they sent us to another one of their stores a few blocks away. Seems they have one store for each type of fishing. 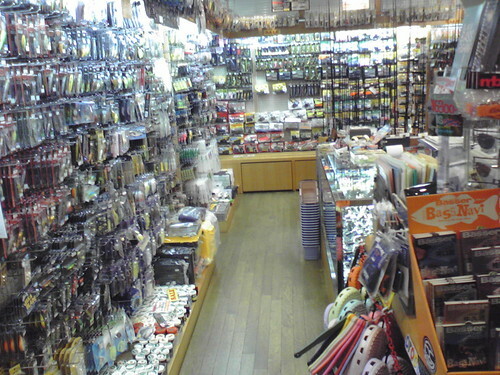 This photo shows a wall of bass lures on one she of the store. The other side has this much bass fishing paraphernalia again. Not to mention the stuff on the wall behind me, and down the stairs to the first floor. So, if fishing is you cup of tea, have a look for equipment while in Japan. Your sure to reel in more than you expected. This entry was posted in Photos, Travel and tagged fishing, Japan, Shopping, Tokyo. Bookmark the permalink.